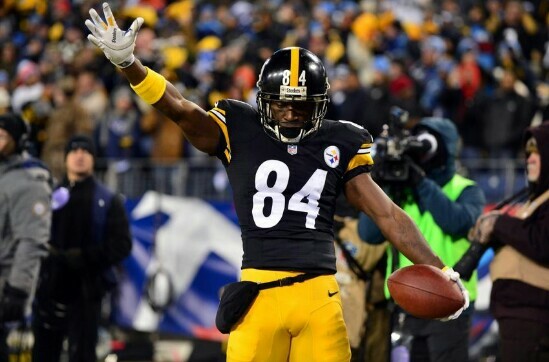 Steelers will Sign WR Antonio Brown to Long-term Deal | "IT'S A STEELERS WORLD"! Antonio Brown(84) celebrates as only he knows how. According to steelers.com’s Bob Labriola, Pittsburgh Steelers standout wide receiver, Antonio Brown is will reportedly be getting exactly what he deserves. A long-term deal with the Steelers, a team that cannot afford to let him go no matter how you look at it. Brown, who is 27, has two years remaining on his six-year, $43 million deal he signed in 2012, and the team is expected to resign him to a second long-term deal before his current contract expires. When another Steelers receiver, Hines Ward was 29 years old he had a very brief holdout before signing a long-term deal with the team. That same season Pittsburgh won their first Super Bowl in 26 years, with Ward earning Super Bowl MVP honors. Before his career was done, Ward won another Super Bowl, and nearly won a third in January of 2011 before retiring as a career Steeler and one of the most beloved players in franchise history. The Steelers have let other talented players go in the past, but letting go of by far the greatest wide receiver/athlete in the National Football League would indeed be a huge mistake. A mistake that now looks to be non-existent. Not saying that Antonio would go CMOFH..”Cash Money Over Family Honey”..but I would not have put it past him. Players like Brown need to not only be appreciated with being paid what they are worth, but also know that their organizations care enough to keep them locked down. Because loyalty leads to “Stability Within The Organization”.. something that has made the Pittsburgh Steelers so successful over the decades.